Desertification is a result of many factors; the development of a model for biodiversity conservation in Uzbekistan is one strategy for combating desertification. UNDP and (Global Environment Facility) GEF recently completed their six year project for establishing the Nuratau-Kyzylkum Biosphere Reserve as a model for biodiversity conservation. Rural development threatens biodiversity conservation resulting in land degradation, resource exploitation, intensive agriculture, and worsening socio-economic conditions. Even though the biosphere has yet to be implemented due to political constraints, all activities lead to success by increasing knowledge about legal, political, village-level, long-term planning, and land use planning inputs necessary for a large-scale biosphere reserve. Such a project is a fine example of a needs assessment and actions for biodiversity conservation and combating desertification in Central Asia. The project was located in Tashkent city and Yangikishlak village of Djizak province. The Executing Agency for the project was the State Biological Control Service (Gosbiocontrol), a body under the state Committee for Nature Protection. 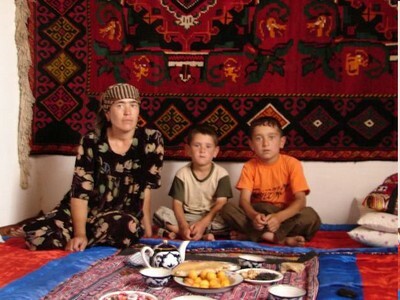 Biodiversity conservation and rural development in Uzbekistan often confront with each other. Major threats to biodiversity in the country include: a) direct destruction of the flora and fauna; b) unsustainable natural resource use resulting from past inappropriate development policies and current socio-economic difficulties; and c) expansion of agriculture-occupied land at the expense of wildlife habitat. These threats result in degradation of the natural habitat and ecosystems. Unique ecosystems are the Nuratau Mountains with adjacent Kyzylkum desert and one of the largest water reservoirs in the country – Aidar-Arnasai system of lakes. Urgent measures to improve the situation and stop loss of the habitat and wildlife need to be taken. Taking into account the increasing threats, the Government of Uzbekistan with support of the members of NABU, had been working on research in this field since 1993. The preparation of the Global Environment Facility (GEF) project proposal started in 1998 and approval was received in 2000. Farish region: local people in Nuratau-Kyzylkum Biosphere Reserve need groundwater for domestic animals. 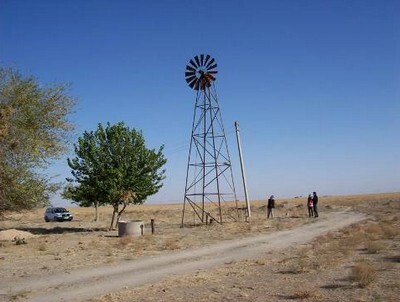 With project support they constructed this wind pump which will help the cattlemen to access water for sheep and cows. The objective of the project was to develop a new, more durable approach to biodiversity conservation in Uzbekistan by directly linking wildlife conservation with rural development. The project should have resulted in the establishment of the first biosphere reserve in Uzbekistan. Due to political constraints the biosphere has yet to be fully implemented. Nevertheless, many actions during the project period resulted in successful activities. The project has initiated a new sub-project supported by UNDP and German Development Service (DED) ‘Development of communities and sustainable livelihoods’ aimed at the sustainable use of the nature resources and improving living conditions of the local population. Funded by Global Environment Facility (GEF), UNDP TRAC, and German Society for Nature Protection NABU, State Biological Control Service (Gosbiocontrol), a body under the state Committee for Nature Protection, Government of Uzbekistan, local village, local authorities. New “inclusive” and sustainable human development-oriented approaches to the conservation of biodiversity in Uzbekistan developed and tested. Accurate and relevant information and communication are important components of the management framework of a biosphere reserve. Good and accessible information is key for good decision-making but also to keep people abreast of new developments, to offer information on the best practices, etc.